Sending an email message is a quick and easy process. You can choose to either send the message immediately or schedule it to be sent at a later time. If you're not familiar with how to compose an email message, see the article Starting a New Email Message for further information. Click on the Send now radio button, followed by clicking Submit Launch Request. A confirmation window will appear showing the details of the message such as the 'From' address, the recipient list(s), and the time that the message will be sent. Click Send and the message will be sent right away. Note: When in the confirmation window, if you see any changes that need to be made, simply click the Go Back button. This will return you to the Send tab where you can go back to any of the previous steps to make the necessary changes. Click on the Send at the following time radio button. Specify the date to send your message by clicking on the Date field. Change the time by clicking on the drop-down menus for the hour, minutes, and either AM or PM. Change the time zone, if necessary, using the Time Zone drop-down menu. Time Zone Send lets you send your message so that it hits your contacts' inboxes at one specific time (eg., 1:30pm) in the local time for their location. Note: Time Zone Send is not enabled by default. Please contact support to activate this feature. Your contact list(s) must have a column identified as the Contact's Timezone. Follow the steps to identify list columns to map this field. Your time zones must be in the TZ format. If a send has recipients in every time zone, the launch can take about 24 hours to complete. To allow for this, we recommend submitting the launch request at least 24 hours before your desired time of receipt. If a recipient does not have a time zone associated with it or the time zone value is improperly formatted, then the email is sent using your account’s time zone. When using the Time Zone Send feature, you may cancel a message during it's launch by selecting the drop down box for this message and selecting Stop Launch. This button can also be found in the Message Report. After you set a start and end time for the message send, Act-On will send messages throughout this window based on system resources and bandwidth. This feature is not designed to send to the same number of contacts at a certain interval of time (eg., 1,000 contacts every three days). An Automated Program is the best way to achieve this purpose. Send Over Time will be most evenly distributed when sending to at least 20,000 contacts over a period of less than seven days. 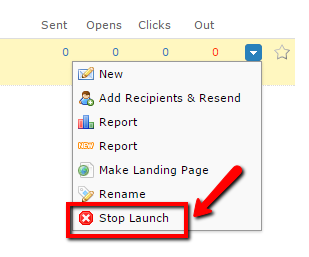 When using the Send Over Time feature, you may cancel a message during it's launch by selecting the drop down box for this message and selecting Stop Launch.